According to the Global Wellness Institute, the wellness real estate industry was worth $134bn (€115.6bn) in 2017, and has been growing by 6.4 percent annually since 2015. It is estimated that by 2020, it will grow to $180bn (€155.3bn). As we become more attached to technology, we also come to realise how important it is to be connected to nature – and how crucial that connection is to our health and happiness. At Quinta do Lago, the five-star real estate, lifestyle and sporting resort community in the Algarve, Portugal, everything from the land to the architecture and facilities are tailor-made to maximise wellbeing. Originally founded by Brazilian real estate entrepreneur Andre Jordan, Quinta do Lago has evolved from a place where wealthy people could retire in comfort and golf to their hearts’ content to an all-encompassing community focused on health and happiness. Residents and visitors enjoy over 300 days of sun every year, allowing them to live an active, outdoor lifestyle all year round. A recent investment of €50m has further cemented Quinta do Lago’s position as one of the most coveted resorts and residential communities in Europe. Fundamental to Quinta do Lago’s focus is its family-orientated nature. As such, a heavy emphasis is placed on creating activities for children and teenagers, who perhaps are not as interested in world-class golf courses. Also important is educating young people in health and wellbeing. Currently, young families represent a large proportion of Quinta do Lago’s audience. There is an inextricable relationship between the space that surrounds us and our mental and physical wellbeing. Wellness architecture takes into account the effect that architecture and design have on those experiencing them. Recent developments in the field of human biology – namely a greater understanding of circadian rhythms – have highlighted the impact and importance of natural physiological cycles on human health and wellbeing. A circadian rhythm refers to our brain’s inbuilt clock, which regulates the timing of biological processes and behaviour, such as sleep and physical performance. The strongest single external factor that influences circadian rhythms is light exposure. Consequently, the most important component of wellness architecture is the way buildings and their interiors interact with light. 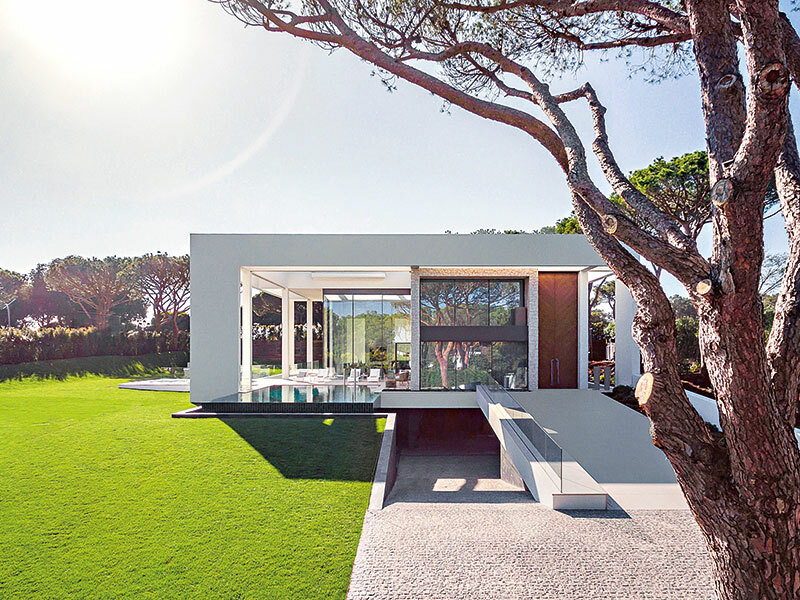 As such, Quinta do Lago incorporates biophilic design into every building it constructs. Stemming from the Greek meaning ‘love of nature’, biophilia is a philosophy strongly felt throughout the resort. Research into the hospitality industry shows that proximity to, and views of, water and green space greatly enhance guests’ experience. In Quinta do Lago’s approach to design, natural materials are used as much as possible, as are natural colours and textures, blurring the transition between outdoor and indoor spaces. Above all, natural light is maximised. According to Oliver Heath Design, the benefits of biophilic design have been well documented across a wide range of contexts. In office spaces, designs that allow in more light or provide a better connection to nature can increase productivity by eight percent. In education, there have been increased levels of concentration and rates of learning. Even in healthcare, biophilic design can reduce post-operative recovery times by 8.5 percent, as well as reduce the need for pain medication by over one fifth. Quinta do Lago’s state-of-the-art multi-sport and athletics facilities, collectively known as the Campus, are both comprehensive in their amenities and inclusive to people of all athletic abilities. While designed for high-level athletes, sports teams and Olympians, the Campus also welcomes amateurs and beginners of all ages. The Campus stretches over an area of 45,000sq ft and boasts six tennis courts, a 25m swimming pool, a high-performance centre and a football pitch, among many other facilities. Further, it is fully staffed with resident specialists, such as trainers, physiotherapists, nutritionists and sports physicians. Quinta do Lago also features an Olympic-standard triathlon course that snakes in and around the resort. For years, Quinta do Lago has been a popular destination for high-level athletes. The perpetually great weather, close proximity to the airport and short drive to pristine beaches on the Atlantic Ocean have all made it a very attractive place to relax and recover. We have done our research to ensure the facilities and service provided meet professional athletes’ standards, while being done in a way that reflects Quinta do Lago’s ethos – in other words, it always feels nurturing, family-centric, collaborative and inspiring. The relative seclusion of the Campus removes the pressures that accompany widely recognised individuals in public environments, giving athletes the freedom to visit and train without disruption. The Campus’ high standards are reflected in the fact it hosted the super-sprint triathlon trials for the Commonwealth Games held in Scotland in 2014. A number of high-profile athletes, including GB Paralympic triathletes and Burnley Football Club, have also used the Campus to train. At Quinta do Lago, we understand facilities for recovery are just as important as those for training, so our high-performance centre has both hot and cold plunge pools, a steam room, a sauna and a relaxation area. Additionally, we have been working with well-known figures to be course leaders in our football programme, which began in April. Professional players and coaches, including Rio Ferdinand and Bobby Zamora, help teach teenagers and younger children throughout the summer. Further, Irish Paralympic champion Mark Rohan manages the Bike Shed on the Campus, where bicycles can be hired for road cycling tours, as well as off-road tracking excursions and guided routes. 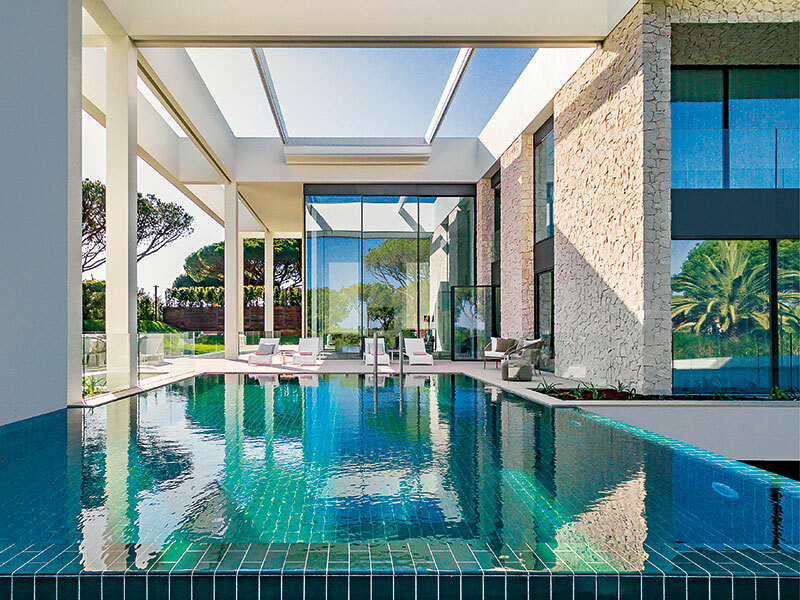 The concept of wellness architecture is best demonstrated in Quinta do Lago’s latest addition: the Lagula Villa. The villa’s open-plan design and modern features combine light and space to create an environment conducive to wellbeing. The white, bright architecture and versatile entertainment space invite a joyful life with family and friends. The Lagula Villa is up for sale for just under €6m and is one of three residential offerings at Quinta do Lago. Another real estate opportunity is Reserva, a modern apartment complex overlooking Quinta do Lago’s lake. Set for completion in 2019, Reserva is composed of 26 garden and penthouse homes, each with extensive terracing and its own private swimming pool, as well as a 24-hour concierge and private gym. The third offering is at San Lorenzo North, a neighbourhood of 26 building plots surrounded by a lake and pine forests. Owners will have free rein over the design of their homes at these sites, and be able to employ architects of their choice. Residents of Quinta do Lago also have access to three nearby championship golf courses, which have won numerous awards, including Best European Golf Venue (World Golf Awards) and Portugal’s Best Golf Course (Today’s Golfer Awards). Due to its reputation, Quinta do Lago has hosted eight Portuguese Opens, as well as a number of other European tournaments. What’s more, Quinta do Lago is just a short driving distance from one of the more attractive natural splendours in Portugal: the Ria Formosa Natural Park. The park features a lagoon and wetlands that have been protected for three decades. Wherever you are within Quinta do Lago, you are never more than a few kilometres away from Ria Formosa; residents can easily walk, run or cycle to the park, which is recognised as one of Portugal’s seven natural wonders. As the wellness real estate market grows and demand increases, purchasing property tailored to maximise wellbeing is not just an investment into one’s health: it is a strong financial investment, too.